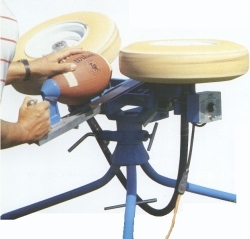 The JUGS Rugby ball machine can throw hundreds of kicks and passes an hour. With its high level of consistency and accuracy this ball machine can allow players to practice catching and receiving passes of all different kinds and repeat the action again and again. 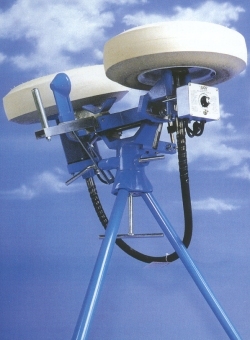 The JUGS rugby ball machine can throw both spiral passes and end over end kicks at distances up to 70m. The distance and height of a pass are controlled by changing the speed of the wheels and tilting the machine upward or downward. Turning a dial changes the wheels speed. A simple lever locks the unit after any lateral or vertical change. Once set, the machine will throw rugby balls to the same spot time after time. The type of pass can be changed from spiral or end-over-end by changing the feed chute and adjusting the wheel angle. The machine can be easily moved by one person - indoors or outdoors. Moving the machine involves tipping it onto its transport wheel and rolling it to a different area like a wheelbarrow. By removing the legs it can be easily stored or even transported in a car boot. The JUGS rugby ball machine can be powered directly from a mains supply or run from a good quality inverter type portable generator rated at 1KVA or more.